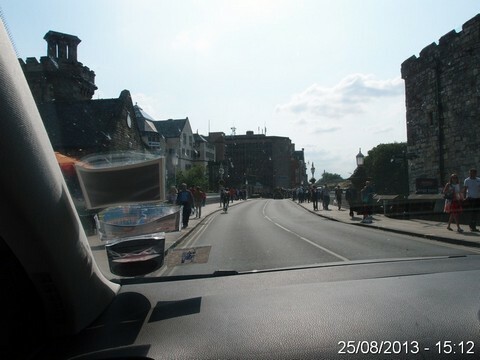 On Sunday afternoon we were heading out of town in the car and after some debate decided to go via Lendal Bridge ‘while we still can’ (traffic restrictions due to start two days later). 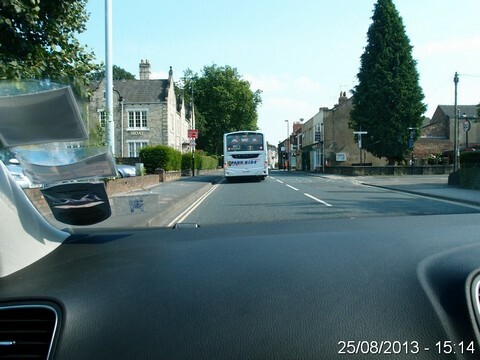 We’d never normally go through town in a car if at all avoidable, and opt to sit in traffic elsewhere for ages instead, usually on Crichton Avenue or Wigginton Rd near the hospital. 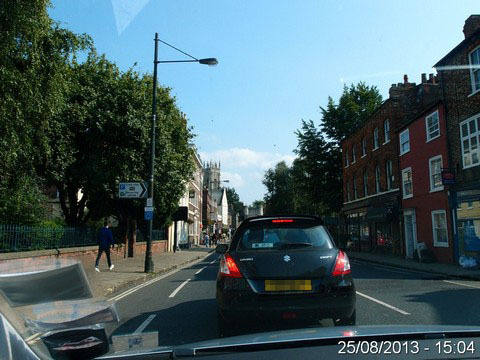 So here we are, on Bootham, about to join a queue of standing traffic. It’s 3.03pm. It’s a Sunday, so it should be quite quiet, but it’s also the Sunday of the last Bank Holiday weekend of the summer, and it’s a lovely day. What will this mean for traffic? I have no idea. I’m an occasional passenger, not a driver. But on this occasion I’m carefully observing. I wasn’t intending to present you, dear readers, with a load of photos taken through a grubby car windscreen. I was just trying out the replacement compact camera I finally got around to getting, making sure it worked. It vaguely crossed my mind that these photos could illustrate a page, but that only seemed worthwhile when looking at them later, when I realised that the time stamp told a story in itself. One that many drivers are no doubt familiar with. The queue began around the end of Marygate. 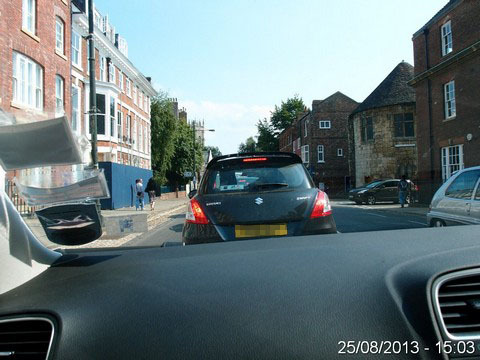 It’s a very short distance from there to the traffic lights, at the junction near Bootham Bar (the top section of Bootham Bar is visible on this photo, above the roof of the car in front). We were sitting here for some time. The queue edged forward very slowly. I walk past these queues of traffic often, and often they’re stretching back much further. I got so bored I forgot to take more photos for documentary purposes. We discussed traffic light timings. Through the lights, turning right, no other traffic ahead, so we reached the next lights in a matter of seconds after leaving the end of Bootham. It’s 3.11pm. 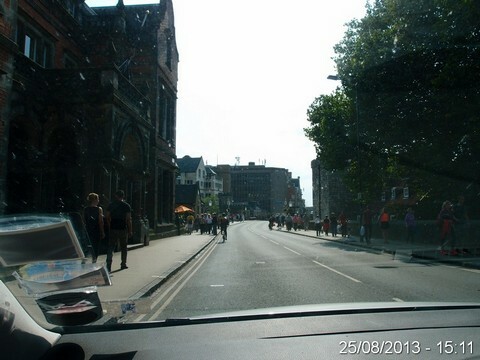 Eight minutes, waiting in the queue at the lights on Bootham. I could walk that stretch in a minute or less. As we passed the Theatre I looked for the massive sign I’d seen a photo of which advertised the imminent restrictions on Lendal Bridge. It was completely obscured by a bus at the bus stop. Suddenly a whole load of things I’d never really thought about much came to mind. Like, how was it going to be enforced, and where were the signs to tell drivers they were about to incur a fine, etc. 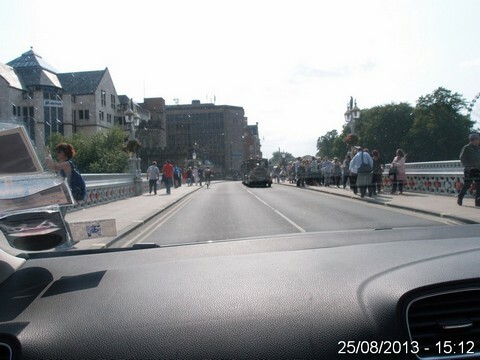 So now we’re on Museum Street, approaching the famous bridge, focus of so much attention of late. It has been presented as being constantly in a state of gridlock, heaving with traffic, so the trial is a brave move at ‘unclogging the corridor’. Seems to have worked already, two days before it starts. No visible traffic. Just us and a bike. Just like so many other times I’ve been over it, as a pedestrian. 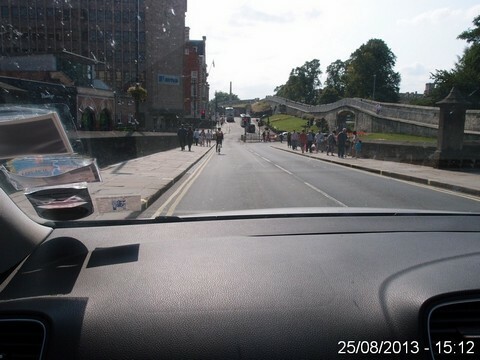 A couple of days later I’d see photos like this, views of the bridge (without the dashboard and car windscreen) posted online as evidence that the Lendal Bridge trial had achieved some kind of pedestrian nirvana never before seen. Oh, but hang on, another vehicle. It’s the NRM road train, trundling along taking people from the NRM to the Minster. I wonder if this will be fitted in somehow in the ‘bus’ or ‘taxi’ category. I expect so. Even though it appears to be causing a congestion problem of its own, with bored motorists in cars behind it. And so we escape the hellish gridlock of Lendal Bridge and head under and around the walls, by the station. And as that handy timestamp shows, we’re on Nunnery Lane by 3.14pm, having gone through three sets of lights since we arrived on St Leonards Place at 3.11pm. I don’t know. It could mean anything you want it to. Like all the other photos I’ve seen in recent days and weeks of Lendal Bridge and other parts of town with or without traffic. I have to admit that I no longer live in York but when I get homesick I like to read your blog, in fact re-reading some of my favourite blog posts is one of my (sad) hobbies! 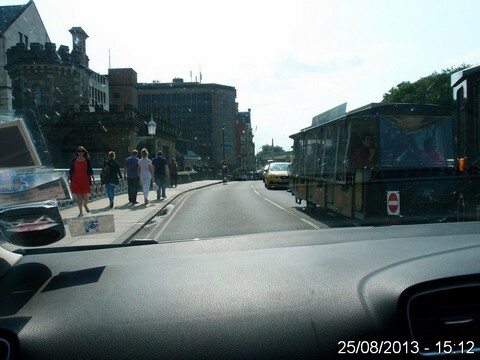 The traffic over Lendal Bridge, and the lead up to it is often very bad, but I still just do not understand why the Council chose to impose trial restrictions on Lendal Bridge before taking other measures first. What will it achieve? Pedestrians will not really benefit as the pavement will not be wider and there will still be plenty of traffic. I expect the restrictions will reduce overall traffic in York but with little benefit to the area around the restriction zone and with increased traffic in a few other areas. Did the Council considered pedestrianising Ouse Bridge as a first step? This would have had much more benefits I’m sure. 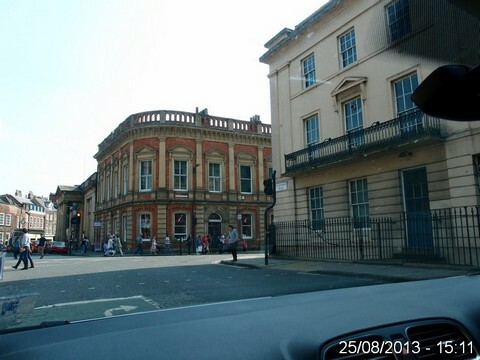 Without the fire station on Clifford Street, and if combined with re-opening the Piccadilly entrance to Castle Car Park we could have pedestrianised the whole street and expanded the garden from the river to Clifford’s Tower and to the War Memorial which is currently trapped on a roundabout. Coppergate, which is too narrow for traffic and has seen a number of incidents between buses and pedestrians would also be able to be closed, making a safer more attractive street. We could also have pedestrianised most of Micklegate too, leaving Rougier/Geoerge Hudson Streets and Skeldergate open for through traffic. This massive expansion of the pedestrian zone would help knit the city centre closer together and revitalise those streets now pedestrianised. So instead of more green space and a large expansion of the pedestrian zone we have an unpopular and slightly vague traffic restriction on Lendal Bridge. I would support such a restriction further down the line, after the closure of Ouse Bridge, after the completion of new Park and Ride facilities and after getting Haxby and Strensall Stations reopened. All I can say, apart from what I’ve posted on this and other pages, is that personally, as a pedestrian, the traffic in York doesn’t bother me, and the only time I’ve noticed really poor air quality was just around the corner on George Hudson St, from standing traffic, at rush hour, fumes rather overpowering between the tall buildings there. I doubt this Lendal Bridge restriction helps with that. Lendal Bridge, being very airy and open and over a river is, I would have thought, a place which has always had reasonable air quality. I’ve never noticed a problem. You asked why they didn’t choose Ouse Bridge, and I’ve seen other people ask the same question. Lendal Bridge is part of the approach to the Minster, and alongside the ‘cultural quarter’, and that’s more important to tourism and our ‘visitor offer’ and our ‘cultural offer’, etc. I guess it looks better to visitors without ordinary residents cluttering it up with their cars and vans. This is really all about how things look to visitors, not really about air quality. I’d like to be able to comment intelligently on your specific suggestions, but I’m not a driver so don’t feel qualified to. Having followed the ‘trial’ closely and with great interest all I can say is that from all angles it looks increasingly ludicrous. An opinion which appears to be shared by friends I’ve spoken to, also non-drivers. It wasn’t wanted by the majority and it’s an embarrassing shambles, in my view. That’s not sad at all, it’s very nice to hear, and much appreciated. I re-read these pages a lot too (checking for typos, fact-checking, adding links), so it’s nice to read that someone else does. I think there are at least three of us. Make that ‘Four of us’!